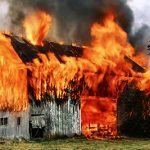 Fire damage to a structure can adversely affect some building elements while leaving others intact, functional, or repairable. An inspection and analysis of an existing building structure can determine the extent of damage and of salvageable portions of the building. Prior to such an inspection, an evaluation of the structure and utilities should be made. A civil, structural or mechanical engineer can contribute to such an evaluation. Depending on the results, it can be determined if the building is safe to enter, needs localized structural shoring and underpinning to allow safe entry, needs electrical abatement, or if it should be approached as a total loss/tear-down. Fire-related damage to a building superstructure (i.e. framing) can be caused by burning, extreme heat (but non-burning) related damage, smoke exposure, or from mechanical damage caused by first responders. Some areas of burned structure may be replaceable, while other adjacent areas may be salvageable. Likewise, lightly charred members may be repairable by “sistering” new structural framing onto the charred member. In some circumstances, smoke damage may be abated by cleaning or coating. First responder related damage, which typically consists of the cutting and removal of roof and wall sections, as well as water damage, can typically be repaired in kind. There are also times, of course, when an engineering evaluation and related cost analysis indicates that the best course of action is to simply demolish the existing superstructure. Even in cases where the superstructure (i.e. framing) requires demolition due to fire-related damage, the concrete foundations that support this framing, as well as site concrete slabs-on-grade that have been exposed to fire-related heat, may be salvageable. The extent of damage can be evaluated by visual inspection, field instrumentation (such as a rebound hammer), or localized destructive testing (i.e. coring) and subsequent laboratory analysis. Often, minor fire-related damage, such as staining and surficial spalling, can be repaired by cleaning, sand/bead blasting, epoxy injection, and by applying an overlay. In addition, an engineering field investigation and/or a review of existing design documents can determine if an existing foundation is compliant with current building code. Another consequence of large fire events (fire storms) is the impact of subsequent rain (or the application of fire suppression water) on the fire zone. The absence of vegetation lost during the fire event can concentrate water flow and increase the rate at which soil absorbs water. These conditions can cause erosion, flooding, debris flows, subsurface water intrusion, and landslides. In addition, this flow can undermine existing improvements such as roads, foundations, slabs, and utilities. ARCCA engineers can evaluate such occurrences to determine the extent of the damage and whether or not the occurrence was the result of, or exacerbated by, the fire. After the evaluation of the extent of fire-related damage is complete, a general repair plan/scope of repair work is commonly needed. Such documentation would provide a General Contractor with the information needed to repair the affected structure. As part of their field investigation, ARCCA’s engineers can provide these services and assist in conveying this information to the General Contractor. In addition, ARCCA can provide engineering repair cost estimates for such repairs or help mediate differences in repair costs between the contractor and adjuster when needed. Kurt Ahlich, P.E. is a Senior Engineer at ARCCA specializing in cause and origin failure analysis, civil and geotechnical analysis, and condition assessments of single-family/multi-family/custom residences, manufacturing facilities, commercial properties and office/government buildings. He is also experienced in construction methodologies and defects, as well as cost estimation.